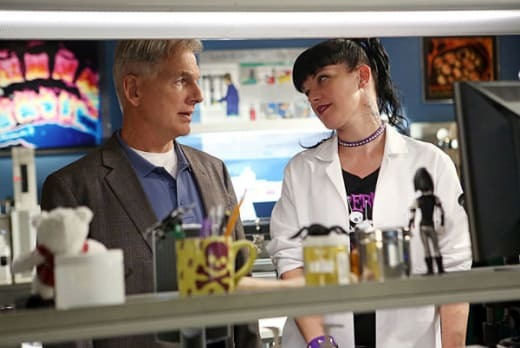 Executive Producer and showrunner Gary Glasberg explained to me yesterday how they went about crafting the first episode minus Ziva, what emotionally might be coming for Gibbs and he supplied some intel on the just-announced NCIS spinoff that will be set in New Orleans. TV Fanatic: Were there also challenges with "Under the Radar" because it’s the first Ziva-less episode? How much do you focus on it, how much you don’t? She’s still very present in the episode. Gary Glasberg: Well, she continues to be, I guess, present is a good way of putting it. She continues to be present for a while ... Ziva isn’t dead. This is her decision to no longer work with them and be a part of this team and that’s difficult for them to wrap their heads around and emotional and devastating, and yet they want only the best for her. But there’s also a part of them that knows that they have to move on, and that’s very much like Gibb’s position and he plays his emotions close to the vest, but he knows that there’s work to do. So the idea of this third episode was, even though they’re all sitting across from that empty desk, was to really reset. And play her absence, but at the same time get us back to all the things that I think we look for in a NCIS episode. TVF: Tony’s clearly the most affected by all this but in the coming episodes will we see this pop up again with maybe a character we didn’t expect to be so affected by Ziva not being around? GG: It continues to rear its head, everyone sort of comments on it. Abby brings it up and Ducky has thoughts on it and Palmer has thoughts on it and no one’s burying their head in the sand. We wanted to treat this as organically and as real as we could. The same way that if you suddenly were no longer working with a co-worker who you were very close too, but that takes a while to move on. It takes a while to realize what the environment is going to be like without her. So, yeah, it’s going to resonate with everybody for quite some time. TVF: Talk to me about the family element that we see in this episode because I just thought there’s such a great family vibe here. Did you feel like that was necessary for this episode? GG: Yeah, I’m glad that you picked up on that because it’s a big part of what we were trying to do. We genuinely want people to understand that the NCIS family is still intact. These people are extremely close, and they work together around the clock and even though Ziva’s gone, they have to keep going. So, the idea was to really reinvest in who they are individually and how they interact with each other, and what their relationships are, and then in how they’re going to handle her absence as well. TVF: Roma Maffia is very fun in this episode and I know we’re going to go through a bunch of different people for awhile at Ziva's desk but will that always be a fun element to the show? GG: I hope so. Like I said, this was such a huge deal for us that we all want people to remember why they watch the show to begin with. So it’s important that we bring back the lightness and the fun and all of the elements that make an NCIS episode. I’m going to date myself a little bit, but...Murphy Brown had this things with revolving assistants. It was always someone different. That was very much the plan of what we could do here for a while. Have some fun, bring different people through, bring back recognizable faces, bring in new faces. Let people really remember at the end of the day why they watch. TVF: So much of the first couple of episodes we’ve talked about Ziva departing but what’s Gibbs piece of this story moving forward? GG: Well, there’s been so much change, the fun part about Gibbs is that he reaches a point where he recognizes that he needs to just focus on the job, and focus on getting back to, I guess what you could call normal. And he plays his emotional cards so close to the vest that there will continue to be little moments where he may show a feeling here or there on the subject, but at the end of the day he’s about getting the job done. So, is there personal stuff that’s going to come up for him? Absolutely, there’s a fantastic episode with Ralph Waite where he goes on this adventure, sort of father-son experience with his dad. You know, life goes on and all of these things will continue to unfold and each of these characters will have things that they have to deal with and eventually everyone will move on. TVF: I love that Twitter is part of the story this week and I’m curious in your research have you found that social media is a big part of what the government’s doing now. Are you guys finding that in what your consultants tell you? GG: You know this is just a really clever idea of taking something clearly extraordinarily important to not only our viewers, but to the world at the moment, and finding a way to incorporate it into the ways that our people are doing business, and doing what they do. And Frank and George came up with this idea and we just all looked at each other and said, “Wow, that’s fantastic.” And we think back at significant tragedies and terrorist acts, and we all see on the news how cell phones are used to capture footage, and the way that instantaneously people communicate from a disaster to loved ones and to friends and that kind of thing. And it just got us thinking there’s a story to be told here and a way to use it, and I was very appreciative that we were able to work with Twitter and actually use them. TVF: I have to ask to real quick though just about the spinoff. What can you tell me at this early part of the game? GG: I came across a story line that was really interesting to me, and it was all about this tiny little NCIS office that’s down here in this fantastic city [of New Orleans], and the kind of cases that they come across, and it just really intrigued me. And the areas that they cover are all the way from the Pensacola Naval Air Station to all the way around the Texas Panhandle and it’s so rich and so colorful and there’s so much to work with, that it felt organic and fantastic to me. And to be able to conceive of something purely from the standpoint of characters and have fun with that, I went to Harmon and he agreed and said, "Let’s do this." So there will be a couple of planted episodes later in the season and I’ve got a lot of work to do. I’ve got to write a couple of great scripts, but I’m excited about that. TVF: Will the tone be similar where it’ll be some drama, some comedy kind of fleshed together? GG: Oh yeah. Absolutely. It’ll certainly be different and hopefully unique in its own way and capture the flavor of the city and music and the fun and everything that New Orleans is, but at the same time it’s still NCIS and it’s important, and especially with Mark Harmon’s involvement, it makes it feel like the show and that’s the target. NCIS airs Tuesdays at 8 p.m. on CBS.